The Art Deco style manifested across the spectrum of the visual arts: from architecture, painting, and sculpture to the graphic and decorative arts. While Art Deco practitioners were often paying homage to modernist influences such as Cubism, De Stijl, and Futurism, the references were indirect; it was as though they were taking the end results of a few decades of distilling compositions to the most basic forms and inventing a new style that could be visually pleasing but not intellectually threatening. The Art Deco style originated in Paris, but has influenced architecture and culture as a whole. Art Deco works are symmetrical, geometric, streamlined, often simple, and pleasing to the eye. This style is in contrast to avant-garde art of the period, which challenged everyday viewers to find meaning and beauty in what were often unapologetically anti-traditional images and forms. Art Deco, similar to Art Nouveau, is a modern art style that attempts to infuse functional objects with artistic touches. This movement is different from the fine arts (painting and sculpture) where the art object has no practical purpose or use beyond providing interesting viewing. With the advent of large-scale manufacturing, artists and designers wished to enhance the appearance of mass-produced functional objects - everything from clocks and ashtrays to cars and buildings. Art Deco's pursuit of beauty in all aspects of life was directly reflective of the relative newness and mass usage of machine-age technology rather than traditional crafting methods to produce many objects. The Bauhaus school was also interested in industrial production, but in a sense The Bauhaus is the polar opposite as it refrained from artistic embellishments - preferring clean and simple geometric forms. The Art Deco ethos diverged from the Art Nouveau and Arts and Crafts styles, which emphasized the uniqueness and originality of handmade objects and featured stylized, organic forms. That crafted quality was emblematic of a kind of elitism in opposition to Art Deco's more egalitarian aim: to make aesthetically appealing, machine-made objects that were available to everyone. Streamline Moderne, the American version of the Art Deco style was a stripped-down and sleek version of the more elaborate and often bespoke European Art Deco style. In many ways, the American style grew and evolved to have a much bigger following and use in the U.S. than in Europe. By the end of the 19th century in France, many of the notable artists, architects, and designers who had played important roles in the development of the Art Nouveau style recognized that it was becoming increasingly passé. At the close of a century that saw the Industrial Revolution take hold, contemporary life became very different from a few decades earlier. It was time for something new, something that would shout "20th Century" from tasteful, modernist rooftops. Lalique's sculpture nearly shouts "Art Deco," so exemplary is it of the style that had by 1930, become the American aesthetic par excellence. Spanning many media and even functions, the style was stamped on everything from luxury ocean liners and racing cars, to toasters and toilets. This piece stands on its own as a sculpture but it doubles as the added, elegant touch to the automobile for which it was designed to grace the hood. With Victoire, the craft of glassblowing produces both a fine art sculptural object and a functional although inarguably luxurious product. Lalique was a French designer known for his glass art, perfume bottles, vases, jewelry, chandeliers, and clocks which he produced first in the Art Nouveau and then in the Art Deco style. The use of glass, a fragile and brittle material, increases the object's status as a rare and decadent purchase. Émile-Jacques Ruhlmann was born in Paris to a family that owned a decorating business, so it seemed only natural that his creativity would find expression in the luxurious home wares for which he became renowned. From furniture and light fixtures to a variety of other decorative elements such as wallpaper, Ruhlmann produced one-of-a-kind, elegant home furnishings using rare, exotic woods with ivory embellishments from Africa and the Far East, thereby incorporating the era's preoccupation with the art of previously considered "primitive" countries. Bridging the divide between the uniqueness of Art Nouveau pieces and the Art Deco impulse to incorporate unusual materials, his pieces demonstrates a blending of Art Deco and the more lavish and ornamental Art Nouveau style that preceded it. A.M. Cassandre, one of the most influential poster artists and graphic designers in the Art Deco style, created this poster for the French liqueur Pivolo Aperitif in 1924. 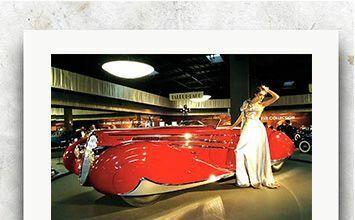 It won an award at the Exposition Internationale des Arts Decoratifs et Industriels Modernes in Paris that same year, which was an exhibition that was widely regarded as having launched the Art Deco style on an international scale. When the British archaeologist Howard Carter excavated the tomb of the pharaoh Tutankhamun in 1922, the event sparked immediate global fascination. Suddenly, Ancient Egypt become a common subject in popular culture, including music, films, popular literature, and the decorative arts. The French jeweler Louis Cartier translated this fascination with Ancient Egypt into his works of the 1920s, many of which incorporate traditionally Egyptian materials and decorative techniques. For some pieces, Cartier even used authentic historical relics. The work of the prolific Russian-French artist, Romain de Tirtoff, better known by the pseudonym Erté, spanned a number of disciplines. His set and costume designs were featured in the Ziegfeld Follies, the Folies Bergère, and a number of silent films produced by Louis B. Mayer. Between 1915 and 1937, he designed more than two hundred magazine covers. Many of these, as in the example above, were for the popular, upscale fashion magazine, Harper's Bazaar. His designs and illustrations also appeared in many widely read women's glossies of the day, including Vogue, Cosmopolitan, and Ladies' Home Journal. Since the majority of Americans were more likely to read magazines and go to movies than to visit galleries and museums, the fact that Erté's work was so visible in popular culture made it possible for the Art Deco style to be disseminated more widely rather than remaining largely the domain of a wealthy elite. Polish-born painter Tamara de Lempicka became a major proponent of the Art Deco style in Europe and North America, creating high-end stylized, trendy portraits of the famous and fashionable: actors, socialites, and aristocrats. She was rewarded richly for her work, which earned her notoriety and critical acclaim. Lempicka was actively involved in the bohemian scene in Paris during the 1920s, where she befriended Picasso as well as the writers Andre Gide and Jean Cocteau. Her dramatic love life often attracted comment and scandal. This Art Deco icon of the New York skyline was designed by William Van Alen, a French-trained American architect previously known for designing several eye-catching skyscrapers in Midtown Manhattan. The building was completed in less than two years since roughly four floors were completed per week, which at the time was a surprisingly rapid rate. Streamline Moderne is the culmination of the American Art Deco style. It developed during the 1930s and is evident in objects as diverse as elegant skyscrapers to budget-friendly kitchen supplies. This pared-down aesthetic also fit with the more subdued world view prevalent in the U.S. following the 1929 stock market crash. Whereas previous designers often incorporated exotic and expensive materials, Streamline Moderne utilized cheap, readily available industrial materials, such as plastic and chrome. The well-known mural painter Jose Maria Sert was commissioned in 1937 to create decorative imagery for the main lobby of the Rockefeller Center, a classic of modernist Art Deco architecture, which was scheduled to open officially in 1939. Diego Rivera was originally chosen to create the murals, but he offended the Rockefeller family by painting the Communist revolutionary Lenin as part of his design for the work, Man at the Crossroads (1934), and so the mural was subsequently destroyed, and the job was offered to Sert instead. This sporty, two-seater coupe was designed by the Italian-born French coachbuilders Giuseppe Figoni and Ovidio Falaschi for rally races. The car was commissioned by a French racing driver and was later owned by a countess and a Hollywood actress, so broad was the appeal of this more sensual iteration of the Art Deco style, one that resisted the minimalism and emphasis on the right-angle and symmetry.